The Worthy, a missile range instrumentation ship at home in Kwajalein Harbor. The Worthy can travel long distances to set up for mission activities. 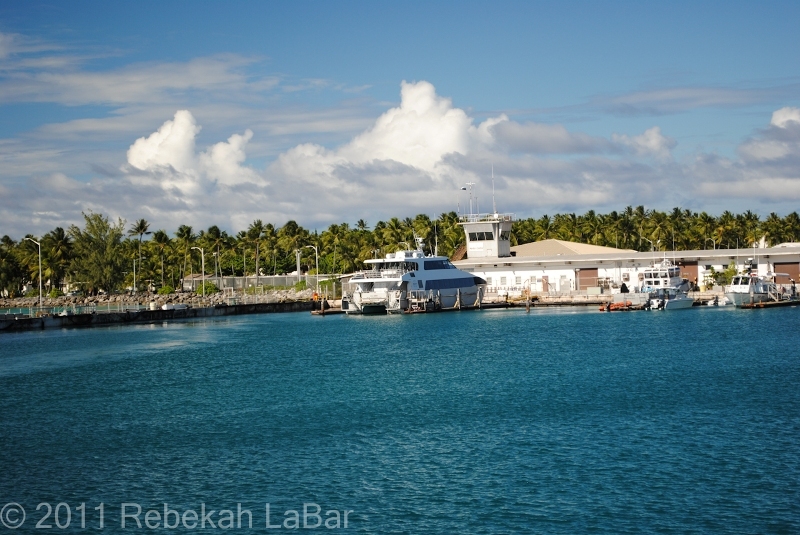 So why is the US Army interested in renting several islands in the Marshall Islands? A short answer is for the purpose of various test rocket missions, as an isolated area in the middle of the ocean. While many of the civilian contractors on Kwajalein may have a rather normal sounding job (i.e., teachers, air traffic controllers, meteorologists, etc. ), we all are here to support mission activities, primarily for the US Department of Defense. Basically we all get our paychecks from Uncle Sam, even though most of us don’t actually work directly for the government. Coming out here, I have had an amazing opportunity to be a part of and to witness several interesting missions for the US Army, MDA, NASA, etc. The most common type of mission we participate in is the Glory Trip (GT). An unarmed Minuteman III (intercontinental ballistic missile, or ICBM) is launched from Vandenberg AFB (in southern California) towards Kwajalein Atoll, a distance of about 5,000 miles that only takes some 20-30 minutes (according to Wikipedia, they can travel at up to Mach 23). Most of the missiles splash harmlessly into the nearby ocean or occasionally the lagoon, or even terminate on the tiny island of Illeginni for the odd land target. Bigger bucks are sunk into intercept missions. We just attempted one of those this last weekend (LA Times: Problem-plagued missile defense system fails in $214-million test). These missions are pretty much what they sound like; rockets are launched and other missiles try to shoot them down. Sometimes the rockets are launched from Roi-Namur and sometimes from Meck. Even little Omelek has had launches in the past. SpaceX used to use Omelek as one of their launch sites, but pulled out not long after I got here, due to budget cuts. Interceptors may be launched from Meck, Vandenberg, Hawaii, ships, etc. 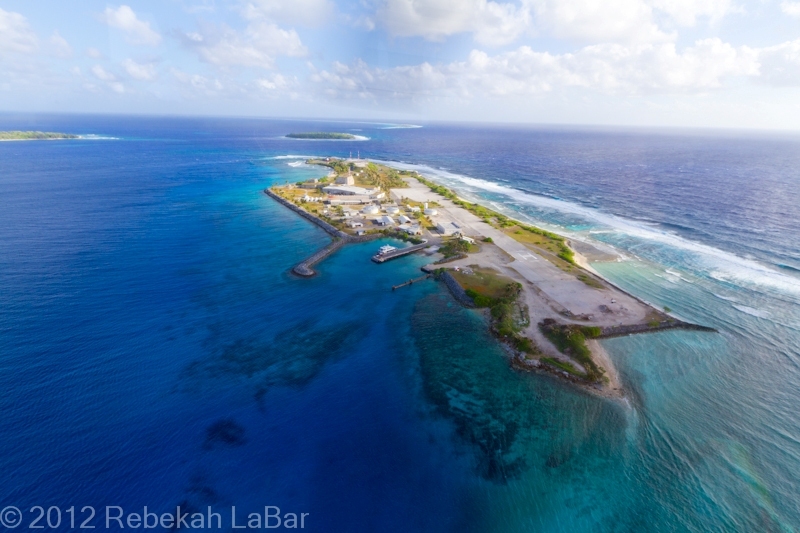 Meck Island is about halfway up the atoll, on the east reef. No one lives permanently on Meck, though some live there temporarily; for the bigger missions they set up large tents. Workers generally commute from Kwaj to Meck on a daily catamaran. The journey takes just under an hour at full speed. Not all of the missions are about testing warfare, though; sometimes we get more scientific missions like cool NASA launches. There have been two NASA missions from Kwajalein that I have seen in the last couple of years. The first was the launch of a high-tech x-ray satellite for studying black holes and such, called NuSTAR (Nuclear Spectroscopic Telescope Array). The satellite was tucked away inside a Pegasus rocket, which was dropped at a high altitude from a large aircraft, an L1011 called a Stargazer. One of my favorite parts of this mission was getting the chance to view the inside of the aircraft and see the rocket up close, while talking to NASA folks at an open “house” (aircraft?). Where first class seating would be, they had a large instrument panel set up for controlling the rocket and deployment of the satellite. The screen on the right is showing a simulation. Living out my fantasy of being a pilot! The real pilot was taking my photo and explaining what did what. On mission night, the aircraft flew a ways south of the atoll and then released the Pegasus. When the first stage of the rocket fired, I was able to go up on the roof of the weather station and watch it fly high into the sky. I also saw the second stage, and just missed the third stage as I went back inside thinking we wouldn’t see it after waiting a while (the site manager remained outside a little longer and did see it, though). The second NASA mission occurred just a couple of months ago, and was a two-in-one mission, called EVEX/MOSC. The object of this mission was to study turbulence and radio waves in the ionosphere just after sunset. There were four rockets launched from Roi (two for EVEX on the same night, and two for MOSC each on a different night), which shot up into the ionosphere and released harmless colored chemical tracers that were then tracked by various instruments. I wasn’t sure exactly what to expect when I looked outside for this first one (MOSC), so what I saw shocked me and creeped me out. Two or three minutes after I saw the rocket shoot up from Roi, I saw a small, brilliant pink orb rapidly grow in size to about maybe five times the size of the full moon. It was smooth but a bit fuzzy, bright (in a near pitch black sky), and pinkish purple, and if I did not know what it was, I might have been completely freaked out. It looked like something out of a bad scifi movie. After the orb hung in the sky for a few minutes, it started to trail off and fade, and after about 20 minutes it was gone. A few days later, the conditions were right for the EVEX launches. EVEX was also bizarre, but I was slightly more prepared this time for what I might see. This time we had a couple of green streaks and two large red orbs. A couple of days later, MOSC was able to launch their final rocket, which looked pretty much like the first, though not quite as impressive (still very weird and mesmerizing). So what do I do during missions? In short, as you could probably guess, the meteorologists provide weather support, giving more detailed and frequent forecasts and nowcasts (very short-term forecasts) to mission test directors. We don’t make any of the decisions as to whether the launch goes or not, but given the weather criteria, we advise those who make the decisions. Mission time can be very exciting and very stressful, depending on the complexity of the mission and whether or not the weather decides to cooperate. I am glad that I have had such a wonderful opportunity to be a part of something like this, especially the scientific missions that may benefit people for years to come. For more mission-related (including Meck Island) photos, check out my missions and Meck Flickr set.